be sure to visit some Saint Patrick landmarks in Ireland. Saint Patrick landmarks are everywhere in Ireland. No matter what region of Ireland you visit, you are sure to find St. Patrick's spirit alive in the earth, the wind, the sky, the sea, and perhaps most of all...the people. But you will also find many landmarks where Saint Patrick is remembered. Here are seven of the most popular to get you started. 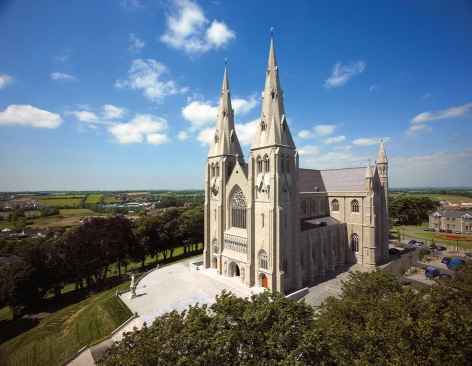 This Saint Patrick landmark, the Cathedral Church of the Holy Trinity, is where Saint Patrick, Saint Brigid, and Saint Columba are buried. Saint Patrick left behind a hand, a tooth, and a bell here which were discovered in the 12th century. The National Museum of Dublin is home to the bell and tooth now. Saint Patrick's hand was enshrined in silver and put in the high altar of the Abbey Church. Also in Northern Ireland, in County Down, is where, according to legend, Saint Patrick died and received his last communion from Bishop Tassach. Saint Patrick built a stone church here in 445 AD. 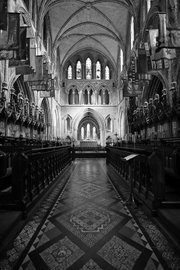 He proclaimed this Cathedral the ecclesiastical capital of Ireland. An honor which, to this day, holds true. Built over four other churches on Saint Patrick's Day, 1192. Saint Patrick's Well Stone, a stone slab that covered the well in which St. Patrick baptized innumerable converts since the 9th century, was discovered in 1901 and is now on display here. Also known as "Saint Patrick's Mountain", the rocky summit is where Saint Patrick lived in solitude for over 40 days of lent in 441 AD. It is also where he "banished all the snakes" from Ireland. This is where they say Saint Patrick baptized his first Irish converts. Although the structure there now wasn't actually there in Saint Patrick's lifetime, this landmark is over 500 years old. Especially memorable is the statue of Saint Patrick, with a shamrock in his right hand held up to the heavens. This island in County Donegal, is where legend says Saint Patrick killed a horrific lake monster. The monster's blood turned the water red. People also believe Saint Patrick stayed in a cave here and, as at Croagh Patrick, struggled with visions of hell and many temptations. Since people believe the water is a cure for the seven deadly sins, numerous people make three-day pilgrimages here every year to benefit from its power. Very useful map of sacred sites in Ireland, including those that are related to St. Patrick. The authentic history of Saint Patrick can be hard to find amidst all the myth and folklore. But thanks to his own writings, a story does emerge that is just as inspirational as any legend. The legend of St. Patrick is a symbolic version of his life as Patron Saint of Ireland and what his life means to the Irish people. Introduction to and list of all the articles about Saint Patrick on Fantasy-Ireland.com.